I'm a 'forever' cat, not an 'until' cat. I’m not an ‘until you get bored with me’ cat. I’m not an ‘until you find a girlfriend’ cat. I’m not an ‘until you have a baby’ cat. I’m not an ‘until you have to move’ cat. I’m not an ‘until you haveno time’ cat. I’m not an ‘until I get old’ cat. I’m a ‘forever’ cat. If you can’t give me ‘forever’, then I’m not your cat. We realise that sometimes peoples circumstances change and they can genuinely no longer keep their pet, in these circumstances then please contact us and we will do our best to help find the cat a loving new home. As stated in our contract of sale any kitten sold is accepted and signed for by their new owners. It is recommended that kittens see owners own vet with 3 days. After this time then we can only take kittens back to sell on behalf of new owner. NO REFUND OF MONEY will be given but depending on circumstances a new kitten may be offered. PLEASE NOTE; If you have tried to contact me by email and not received a response please phone as sometimes my computer plays up. I will always answer emails if I receive them. please note that I only sell breeding girls to responsible homes who are aware of the needs of newborn kittens and are also preferably registered with the Ragdoll/RagaMuffin cat clubs. I am aware that in current financial times it can be expensive for anyone wishing to purchase a kitten, therefore I am happy to take payment by installments if it helps make things easier. Cheques must be cleared approx. 1 week before kitten is collected. All kittens sold as pets will be required to be neutered. Condition of sale of pet kittens is that Transfer slips will be withheld until confirmation of neutering is received from your vet. Delivery may be possible at an agreed cost. Please note that although you are welcome to enquire about reserving a kitten any deposit paid on any kitten reserved is refundable if vet finds anything wrong at first health check and vaccination at nine weeks old. (which is rare). I do keep a waiting list for people wishing to be kept informed about a particular colour/pattern or if they would like a kitten from a particular cat, just email me with your details and I will inform you when I have suitable kitten for you. 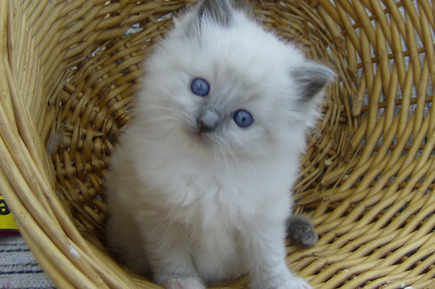 Please be aware that you are always safer to buy your Ragdoll kitten from a registered breeder (TBRCC etc) as these breeders have taken a lot of time to attend teaching seminars etc and will always be available if you have any concerns regarding your kitten. They breed for the love of these beautiful cats and always put their welfare first. Please note that pedigree papers / registration papers will be shown but withheld until confirmation of neutering/speying is provided.